Racks feature three shelves “ two of which are heavy duty for kegs and the third (usually on top) is for general storage. Heavy duty shelves: Rectangular frame of 1 1/2" x 2 3/4" x 0.07" wall extruded aluminum square tube, with 1 1/4" x 2 1/4" x 0.100" T-bars welded inside perpendicular to shelf length. 3" spacing between T-bars. Top general storage shelf: Rectangular frame of 1 1/2" x 1 3/4" x 0.07" wall extruded aluminum square tube, with 1 1/4" x 2 1/4" x 0.10" T-bars welded inside. 3" spacing between T-bars. Shelves are adjustable in 2" increments. Each shelf corner has a welded-in-place heavy duty extruded aluminum collar with set screw. Posts are 1 5/16" diameter, marked in 2" increments, and include end cap on each end. Shipped knocked down, and assembles easily with allen wrench provided. KR1842A 18" x 42" x 76" aluminum beer keg rack with 4 keg capacity. 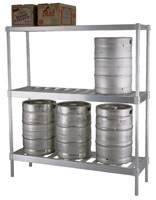 KR1860A 18" x 60" x 76" aluminum beer keg rack with 6 keg capacity. KR1880A 18" x 80" x 76" aluminum beer keg rack with 8 keg capacity. KR1893A 18" x 93" x 76" aluminum beer keg rack with 10 keg capacity. Features 6 posts.